What do you think goes best with loads of beer? Is it sausages? No… how about roller coasters? Nope, definitely not. The real answer: dancing on benches with 10,000 of your newest friends. And you can’t dance on benches (at least, not without looking foolish) without a heavy dose of Oktoberfest music and songs. What kind of music can you expect at the Munich Oktoberfest? 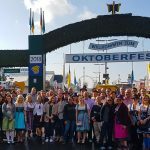 Oktoberfest songs are indeed of the oom-pah-pah, bobbing up and down in your seat, variety – but not exclusively. Sure you’ve got some polka over here… but you’ve also got some electric guitar, hard rock busting speakers over there. Oktoberfest music includes both traditional German brass band styles intermingled with modern classics, and all shouted at the top of your lungs. Like, until you have no voice left to complain about your hangover with the next day. Get your dance on with the most popular Oktoberfest songs. But as they say in Germany*, there’s a fine line between polka and “Party time!”, and that line is the digital reading on a decibel meter. Until 6 PM inside the beer tents, it’s the traditional German oom-pah-pah played by house brass bands that you’ll hear but it’s kept at a decibel level below 85 (that’s more than a garbage disposal but not quite a lawn mower). After 6 PM, all hell breaks loose and probably takes a few eardrums with it. It’s after 6:00 that you’ll hear more of the modern, upbeat songs that require electric instruments and your full boogie potential. *We just made that up. While the selection of Oktoberfest music is as wide as your beer mug is deep, there are a handful you’re absolutely sure to hear and definitely more than once. The shortest of the Oktoberfest songs on this list and the one you’ll hear about every 15 minutes. And you’ll love every second of it like you’ve never loved anything before. Put your mug up in the air, move your mouth to pretend like you know the words (let’s be real here), and when it’s done, toast those around you and one, two, three, drink up! 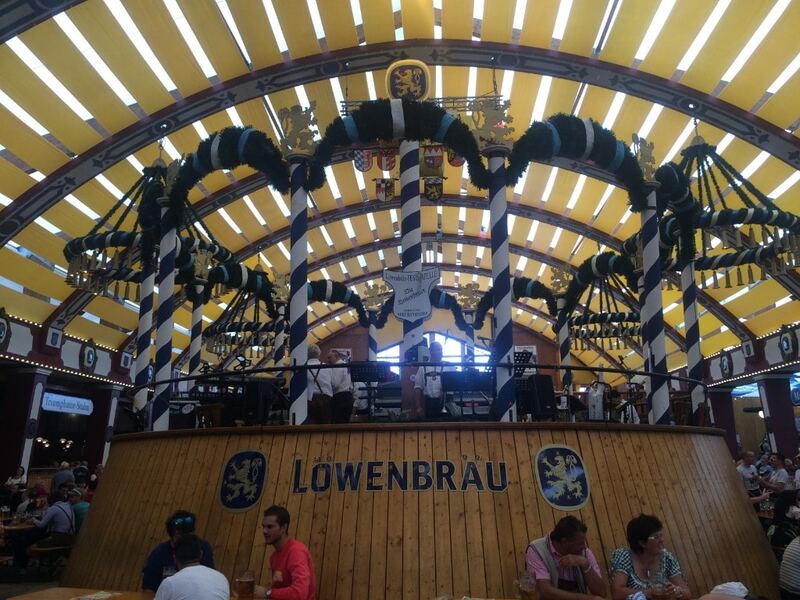 This one is an anthem to getting your drink on at the Hofbräuhaus—an activity you’re almost sure to partake in on your trip to Munich. The only words you’ll need to know, and the only ones known by the masses apparently, are “Eins, zwei, g’suffa!” Trust me, you’ll know it when you hear it—coming to you at the volume of a typical household food blender. It will be physically impossible to sit still when this badass, instrumental German jam comes on. You’ll be bobbing and weaving, jumping and jiving, then the music speeds up faster and faster until you’re spilling beer just all over the place and YOU’VE NEVER FELT SO ALIVE. 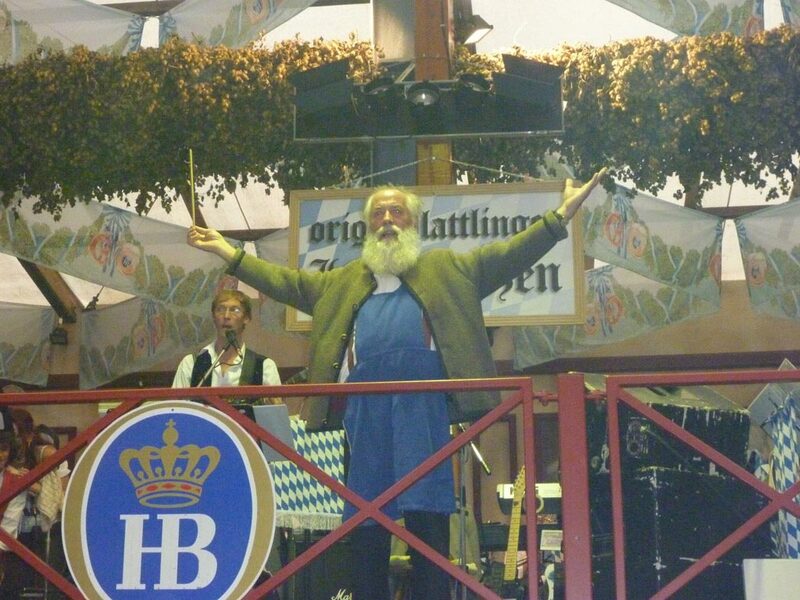 Oktoberfest music for life! There’s one thing that happens both when you drink a lot of beer and when you’re surrounded by Oktoberfest songs—you start acting like a child. 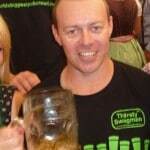 Perhaps this is the reason that “Fliegerlied” has become so popular at the world’s largest beer festival. “Fliegerlied” is essentially a children’s song. About animals. (Why wouldn’t people love this?) You don’t need to know the words for this one, but don’t you dare leave Munich without learning the dance moves. This one is a mystery but just go with it. The Lichtensteiner Polka is an easygoing, day-drinking Oktoberfest tune, perfect for the before 6:00 scene. Ja! Ja! Ja! On the list of Oktoberfest songs, this is the most recent. Released in 2013 by pop star Helene Fischer, this is now Germany’s second most successful song ever. We can only assume “Ein Prosit” is first? You’ll become so hooked on this song, I’ll bet my beer on you picking this up on iTunes before your flight home. “Cowboy und Indianer” is… well, it’s a love story. The kind of love story that involves lassos, a lonely cowboy, and some questionable roleplaying. But hey, it’s really fun to sing—“Ooh, ooh!” This song also has a few signature moves of its own but I’ll tell you about those when you’re older. Even songs released over ten years ago by Austrian DJs aren’t safe from becoming hit Oktoberfest songs. Such is the case here, with a song that’s actually a love story. Sappy lyrics aside, it’s a pretty kickass drinking tune. From a guy named Denver with a song about West Virginia comes one of the most popular Oktoberfest music renditions EVER. Why, you ask? Your guess is as good as ours. Scour Google for answers and the best reasoning you’ll find is: “There’s a lot of beer drinkin’ at Oktoberfest.” Well we can’t argue with that logic. The Oktoberfest version of this one is much more entertaining than the original and asks some very important questions in between chorus lines. As it appears all good drinking songs do, “Living Next Door to Alice” confuses the crap out of us as to how it became a hit Oktoberfest song but who are we to question success? Some songs just don’t sound the same after you’ve heard them shouted at ear-piercing decibels by thousands upon thousands of beer drinkers. This is one strong example. There isn’t an Oktoberfest-goer, or human alive for that matter, who doesn’t know the words to (the chorus of) this song. It’s fun to sing, you can’t forget the words no matter what number litre you’re on, and it just brings everyone together. It’s world peace we’re after, after all. So… maybe this doesn’t actually qualify as one of the Oktoberfest songs but it should be mentioned. The “Seven Nation Army” chant has totally become a thing. At Football games, at futbol games, and, apparently, in those big tents where you try to outdrink the guy next to you. Call it a war cry if you wish. Nope, this song is not Spanish—it’s most definitely German. It’s also, to us, the saddest of all the Oktoberfest music, for it’s the anthem to the end of Oktoberfest. Played loud and proud in the Hacker-Pschorr tent at closing time on the last night of Oktoberfest, fest goers wave their sparklers in the dimly-lit tent. Some get teary-eyed, some get nostalgic, and at least one person probably gets burned. Right? 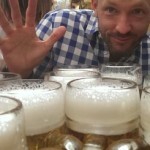 Here are some more things you need to know about Oktoberfest in Munich before you go.